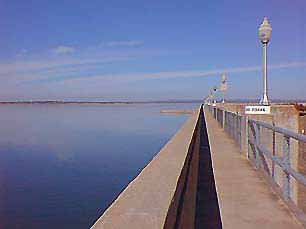 "Lake Buchanan is now full and BEAUTIFUL!" 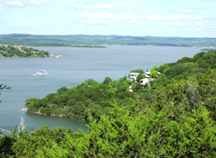 Lake Buchanan (pronouced buh-CAN-un) is the second largest of the Highland Lakes in Central Texas with a length of 30 miles and a width at the widest point of just under 5 miles and a shoreline of 124 miles. It is named for Representative James P. Buchanan (1867-1937), not the 15th President of the United State as some believe, who is credited with securing the funding to build the lake and dam. When it was built, 1938, Buchanan Dam was considered to be the longest multiple-arch dam in the U.S. with a length of just over two miles. 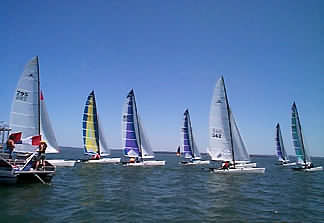 The lake is very popular with boaters, fishermen, campers and swimmers. 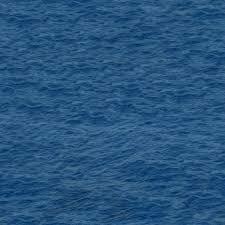 The lake is so large that you will never feel crowded on the lake. There is always plenty of "elbow room" on each of the Highland Lakes. 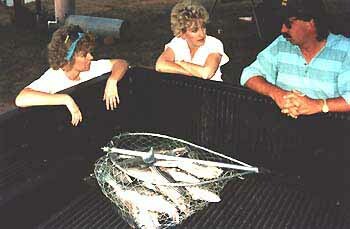 In 1995 over 1 1/2 million Striper Bass were stocked in Lake Buchanan. 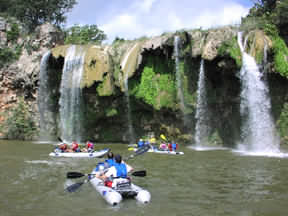 To find a fishing guide to take you out on Lake Buchanan - click here. 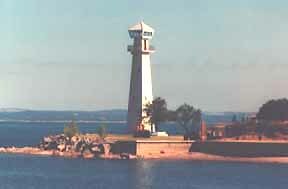 The photo above is a privately owned lighthouse that is near Buchanan Dam. 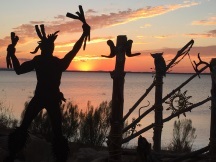 It can be seen as you drive along at the south end of Lake Buchanan on Hwy 29. 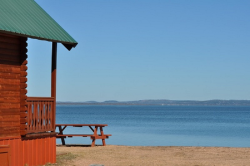 "Where Heaven Kisses the Lake"
Located on scenic Lake Buchanan near the beautiful Fall Creek waterfall, Hi-Line Lake Resort has 16 waterfront cabins, 7 waterfront RV sites, and 46 RV sites overlooking the lake. 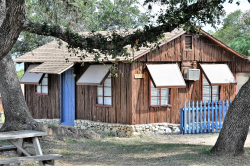 The Hi-line Lodge sleeps 20 and is great for family reunions. 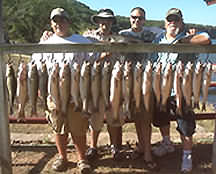 Stripers and Trophy Catfish guide service on Lake Buchanan and Inks Lake. Ask about the Fish and Chips Package for people who like both golfing and fishing. Bait and equipment are furnished. You can count on Ray Williamson to provide you with everything you need to catch stripers. He enjoys guiding novice and experienced fishermen alike on Lake Buchanan in the beautiful Hill Country of Central Texas and teaching novice fisherman how to find the big ones and catch them. Giles Summerlin with RE/MAX of Marble Falls specializes in Lake LBJ Real Estate and Texas Hill Country Lake Living. If you are looking for a floating dock, deck, boat lifts and personal watercraft lifts, Spillar Boat Docks is the place to call. Their family operated business has been building boat docks since 1945 in the Highland Lakes area. throughout the entire year in the area. Need a web page? Want to have your web page listed on this web site?